Our company, Kasper Electric, has been the electrical contractor Delray Beach, Florida can rely on since 1978. We are a family owned business, and we have a second generation master electrician at the helm, so our roots in the area run deep. As locals, we genuinely care about people in this beautiful Palm Beach County community, and we endeavor to build long-lasting relationships. The fact that we have been in business for over 30 years says a lot about our customer satisfaction rate, and we do everything possible to maintain our reputation each and every day. If you are in City Center, Kingsland, Delray Shores, Country Club Acres, Franwood Pines, or any other part of Delray Beach, Florida, we can provide fast, efficient, and effective electrical services of all kinds. If you need electrical repairs, Kasper Electric can and will identify the source of the problem and take the appropriate actions to rectify the situation. Plus, in addition to our electrical repair work, we can also provide upgrades that keep you and your family safe. Here in South Florida, we are very vulnerable to strong tropical storms and hurricanes that can cause power outages that can last for days. A home generator can provide a great deal of peace of mind, and we install emergency backup generators of various different types. Plus, we can also be of assistance if you are looking for outdoor lighting or landscape lighting to prevent accidents, deter would-be intruders, and beautify your property. In addition to our residential services, we will also be there for you when you need an expert commercial electrician. Since we have been building our business for decades, we have some advanced capabilities that many other commercial electrical contractors cannot match. 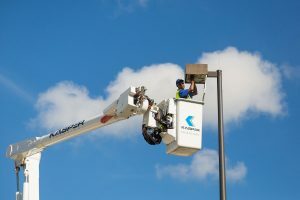 A commercial electrician may be called upon to handle some challenging projects that are large in scope, and access to high places may also be necessary. Our company can meet these challenges, and we consistently exceed the expectations of our commercial customers. Contact Kasper Electric Right Now! Quality customer service is very important to us, so we assure you that you will feel comfortable from the first moment that you reach out to us on the phone. If you ever need the services of a Delray Beach, Florida electrician that you can trust for quality work at affordable prices, give us a call at 561-285-8036.